Emerging Leaders Conferences (ELCs) are an annual series of events hosted by the World Youth Alliance North America, which seek to bring together critical thinkers to examine key issues. The conferences provide young leaders with special training on programs in those areas to give them the adequate tools to make a difference in their own communities. 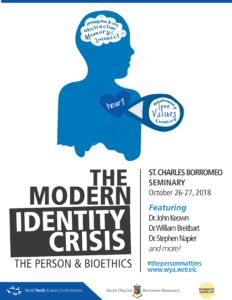 In 2018, the theme for our ELCs is the Modern Identity Crisis: The Person & Bioethics, and seeks to provide students, young adults, and communities with fundamental tools to grasp the relationship between the human person and bioethics, and to respond to the cultural crisis manifested in issues such as surrogacy and assisted suicide/euthanasia. On October 26-27, 2018, we are co-hosting with the Thomistic Institute an ELC in Philadelphia. See more details and register for the ELC here.